Today’s post is a long overdue return to the topic of Uyghur wood fire oven breads. Some day maybe I’ll have an opportunity to build my own tonur تونۇر (or as they are more commonly known in the US, tandoor–see here for an earlier post on the subject of Uyghur tonur breads), but for now I have to approximate the effect by using our gas oven on high heat with a few bursts of steam. The bread that I’m making today is a type of nan (flatbread), and it contains seasoned chopped mutton throughout the dough. This style of bread is popular between Xinjiang and Uzbekistan, where it is known as göshnan گۆشنان in Uyghur and go’shtli non гўштли нон in Uzbek. Both words mean “meat bread”. The genre of “meat bread” can contain a few different styles. 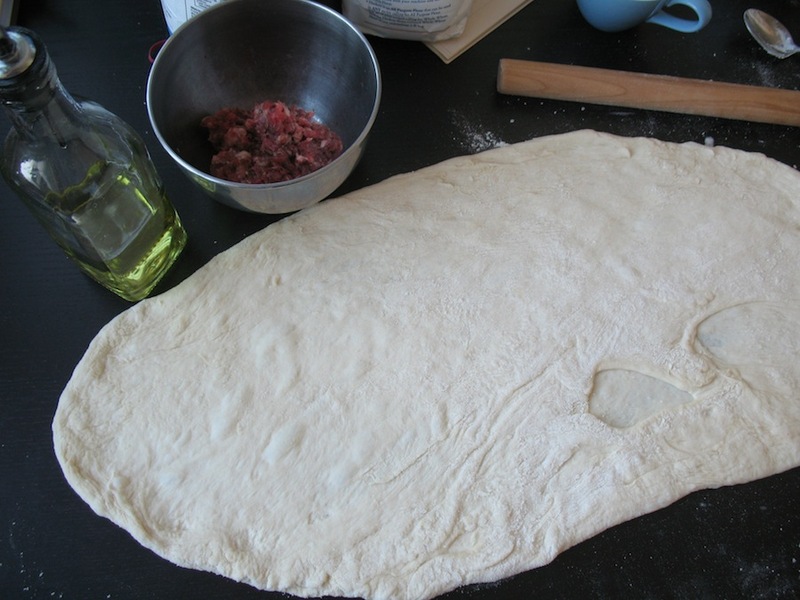 Today I’ll incorporate the meat mixture into the dough with a coiling technique similar to the method for making scallion pancakes. 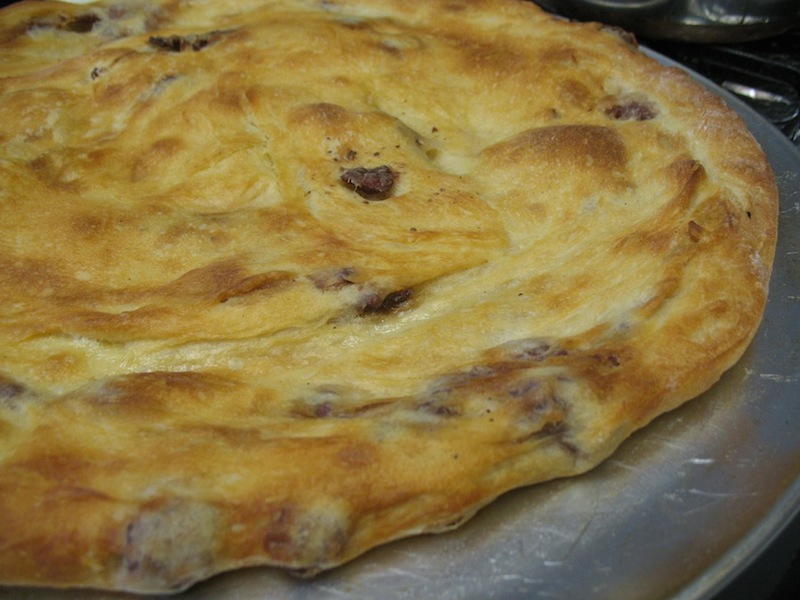 There are also other ways that “meat bread” are done in Central Asia. 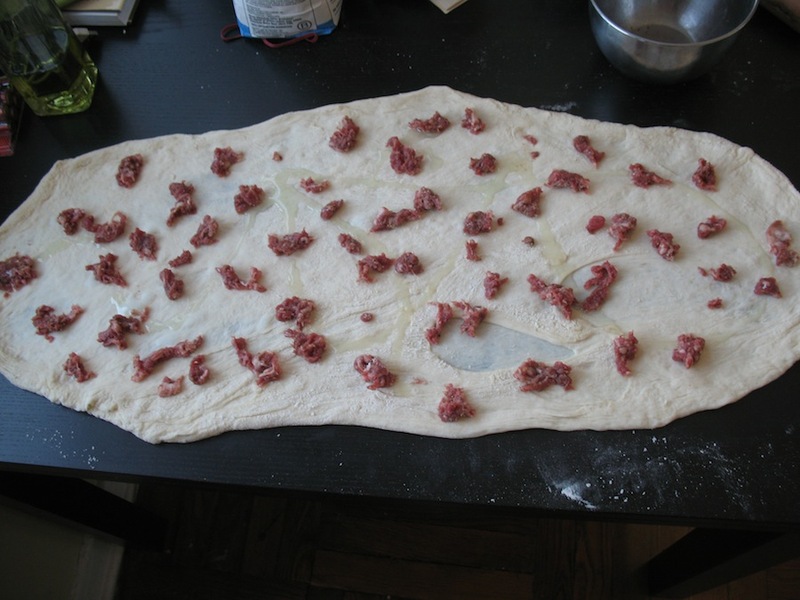 Here is a link to one alternative Uzbek method that is more like a bagel-shaped meat pie. 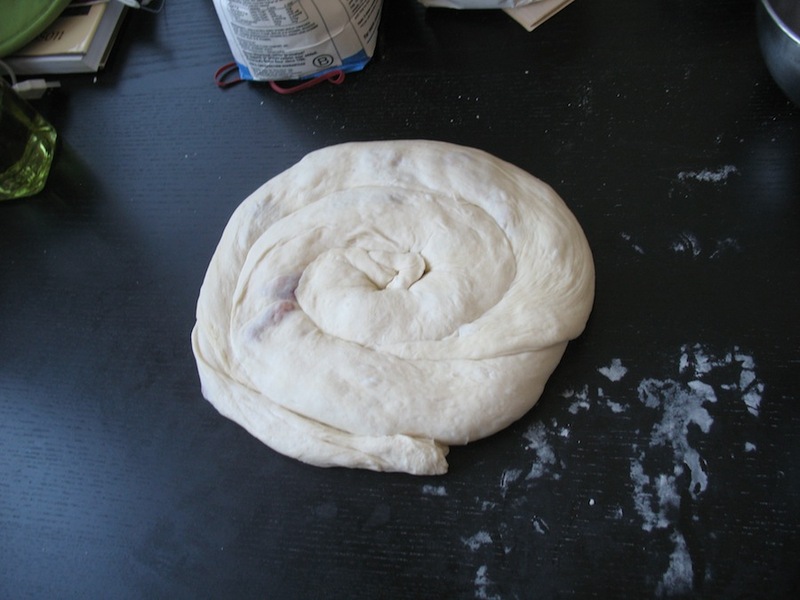 Yet another method is even more a pie than bread, with two rolled-out dough layers pinched together. Here is a link to an Uzbek blog with one such example. I have seen pies like this baked, or even fried in a wok in a lot of oil. 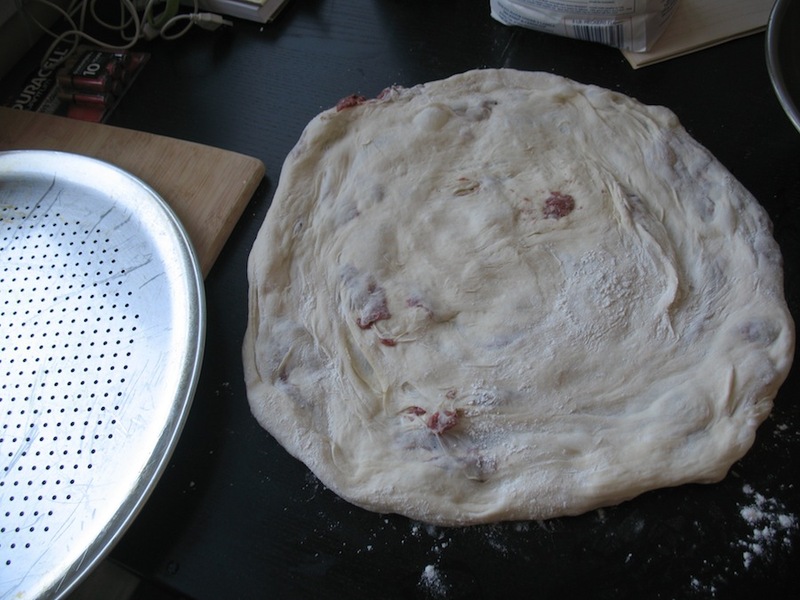 I usually make bread or pizza dough with about 2 cups of flour, 3/4 cups water, a tsp of salt and a tsp of yeast. 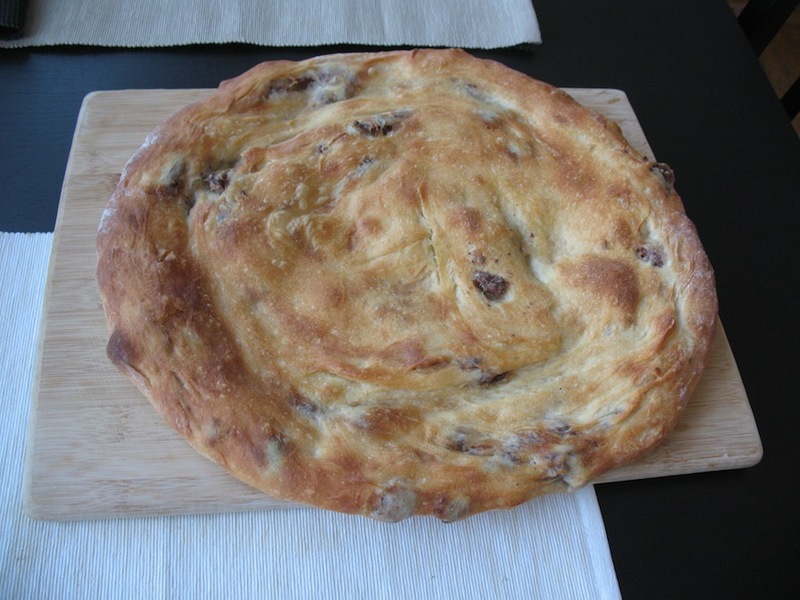 If you have the time to do a preferment, the bread will have a little more flavor. See Peter Reinhart’s books to learn more about preferments and instructions for excellent breads, highly recommended. 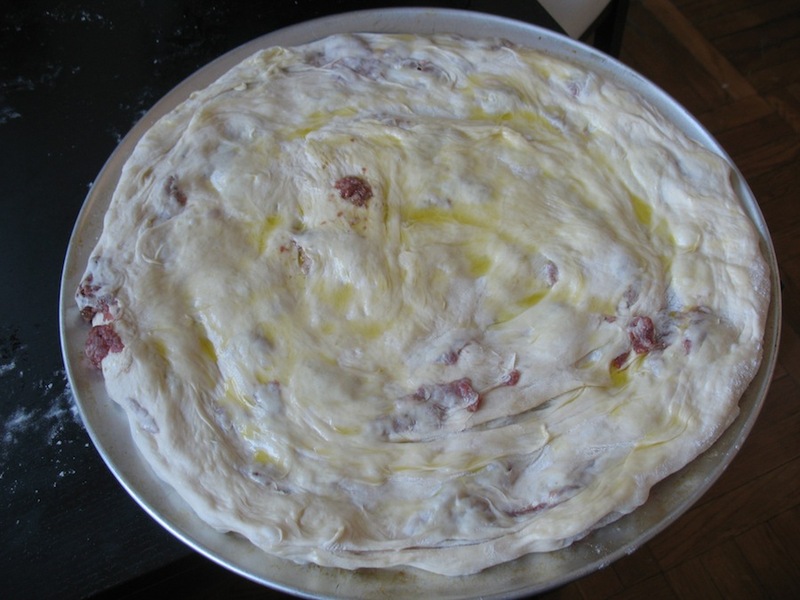 Some cooks add egg to the dough as well. Mix these ingredients and set aside. put on your meat and onion mixture (note-I didn’t use onions this time and regret it). top with some oil. 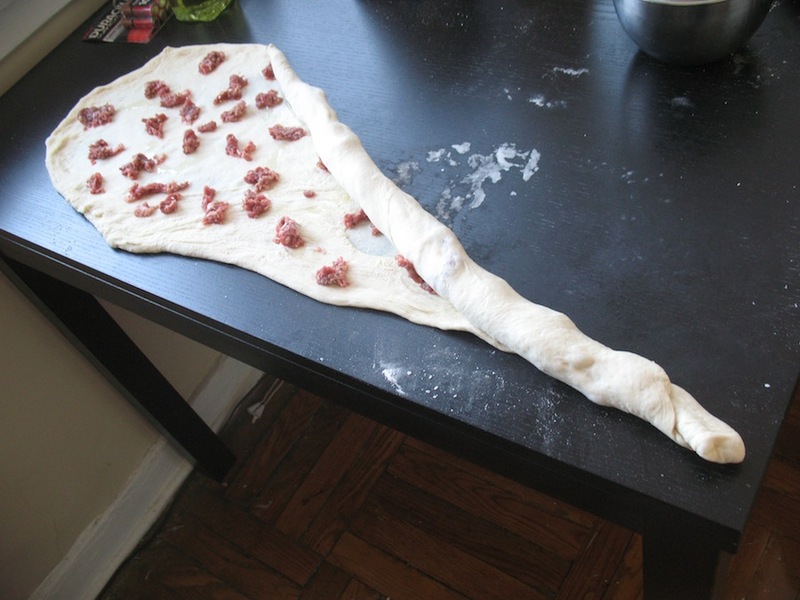 flatten dough like you are doing a pizza (i.e. by picking it up and stretching it over your hands. Traditionally this bread is thinner in the center and thicker around the edges. Some cooks puncture the middle area with a fork or other device to ensure the center doesn’t rise. I didn’t punch the center, I don’t mind a little irregular rising. Let the bread rest before tearing into it. This bread is a little flaky, due to the oil in the roll. This entry was posted in - Recipes, Central Asia/Uyghur food and tagged Ўзбек, гўштли нон, 肉馕, go'shtli non, goshnan, O'zbek, Uyghur, Uzbek, گۆشنان, ئۇيغۇر. Bookmark the permalink.